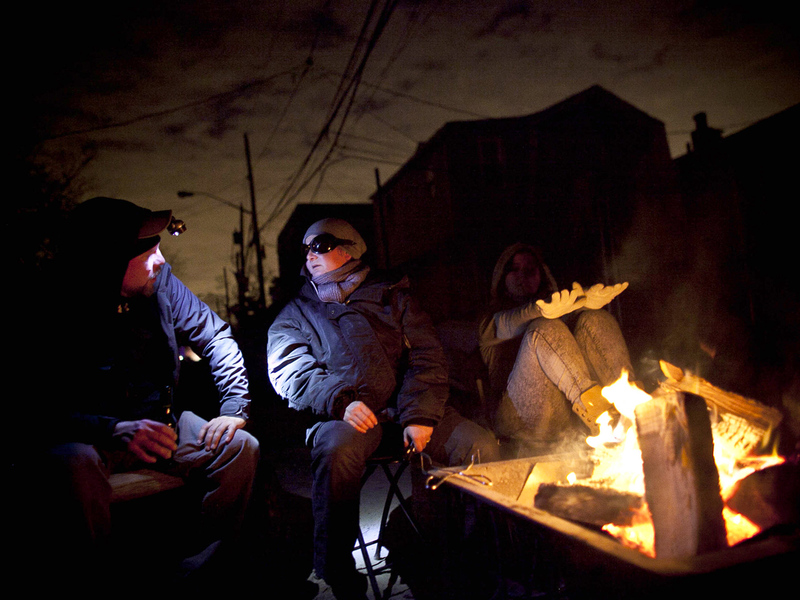 With temperatures falling across the region and a looming nor'easter expected to strike Wednesday, officials are urging victims of Sandy who still lack power and heat to find ways to stay warm to protect against major health risks like hypothermia. "If you are elderly, or you have an infant under a year old, or have heart disease or other medical conditions, you really should go to a warm place," New York City Mayor Michael Bloomberg urged at a Sunday press conference. "If you find yourself shivering uncontrollably, or if you see someone who is disoriented, those are symptoms of hypothermia. And anyone with them needs to get to a warm place, covered with blankets, a hot water bottle - anything you can do to get them warm quickly." About 1.4 million homes and businesses remain without power in the wake of Sandy, down from a peak of 8.5 million. Overnight temperatures have dropped into the 30s for some in the region, leading Mayor Bloomberg to announce that up to 40,000 New Yorkers may need to be relocated. Governor Andrew Cuomo said the state is up against "a massive, massive housing problem" for neighborhoods or buildings that were so damaged by the storm they won't have power for weeks or months. What caused generators to fail at NYC hospitals? On his Twitter account, Cuomo also urged people to look out for the symptoms of hypothermia. Hypothermia is most likely to occur at very cold temperatures, but can occur at temperatures above 40 degrees if a person is chilled from rain, sweat or cold water. The condition sets in when the body begins to lose heat faster than heat can be produced, causing it to turn to stored energy. That results in abnormally low body temperature which impedes a person's ability to think clearly or move around well, which the Centers for Disease Control and Prevention says makes hypothermia even more dangerous because a person may not realize it's happening and can't do anything about it. In addition to symptoms Mayor Bloomberg mentioned -- shivering and disorientation -- hypothermia may cause fumbling hands, memory loss, slurred speech and drowsiness, according to the CDC. Dr. Robert Glatter, an emergency medicine physician at Lenox Hill Hospital in New York City, told CBSNews.com in an email that it's not uncommon for hypothermia sufferers to remove their clothing as a response to the prolonged exposure. He added the condition affects the nervous and cardiovascular systems, potentially leading to low heart rate and arrhythmias. Victims of hypothermia are most often elderly people with inadequate food, clothing, or heating, babies sleeping in cold bedrooms, people who remain outdoors for long periods and those who drink alcohol or use illicit drugs. Infants with hypothermia may display bright red skin that's cold to the touch or very low energy. The CDC advises people who see these signs in others to take their temperature immediately, because if it is below 95 degrees, emergency medical attention is necessary. If medical care is not immediately available, get the person into a warm room or shelter and remove any wet clothing. Start by warming the center of the victim's body first with an electric blanket, including the chest, neck, head and groin, or use skin-to-skin contact under loose, dry layers of blankets, towels or other clothing, the CDC advises. Give sufferers a warm, non-alcoholic beverage to help increase the body temperature. After temperature has increased, keep the person dry and wrapped in a warm blanket, especially the head and neck, and seek medical attention as soon as possible. If the person has fallen unconscious from severe hypothermia, provide CPR and get emergency medical assistance. In some cases, hypothermia victims who appear to be dead can be successfully resuscitated, according to the CDC. Those using generators to stay warm should be aware of risk for carbon monoxide poisoning, which has already been tied to several deaths post-Sandy. "If you live in an affected shore community, do not use generators or cooking stoves indoors to dry clothes since this can lead to carbon monoxide poisoning," Glatter warned. "The symptoms of carbon monoxide poisoning include a severe frontal headache, dizziness, nausea and vomiting -- almost a flu-like syndrome."